The Food Alphabet and More: Boulangerie22 opens it's 9th branch in Festival Supermall, Alabang this May 21st! 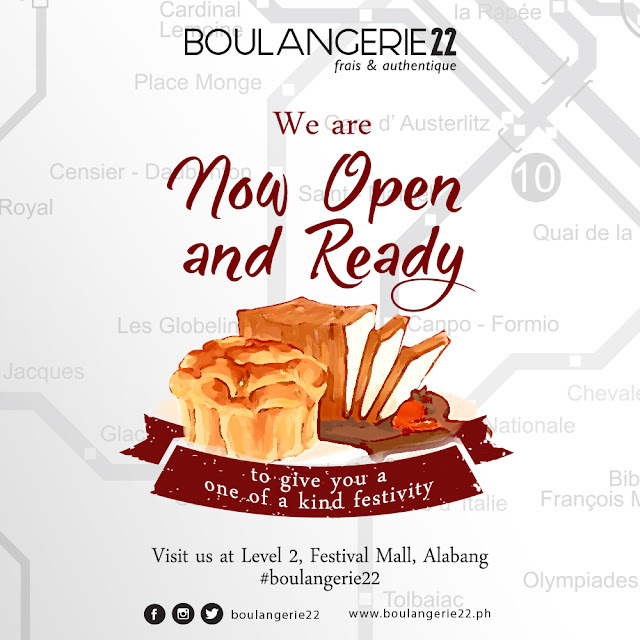 Boulangerie22 opens it's 9th branch in Festival Supermall, Alabang this May 21st! We are bringing closer the irresistibly delectable breads and pastries of Boulangerie22 at the heart of the south with the official launch of our second mall location in the metro on May 21. From melt in your mouth croissants, savoury sourdough pizzas, and sweet tooth satisfying macarons, there is something for every decerning palate. As we continue to expand our branches all over Manila, expect nothing but the top quality and best tasting products at reasonable prices. Now you don't have to travel far to Europe or elsewhere to get a taste of world class breads and pastries! As a way to welcome our customers in the south, we have a special treat. The first 122 customers to visit the store will be able to fill their B22 bags with whatever they can fit among 38 selected breads in 22 seconds for only P22! The first 222 customers will also get a 50% discount on all our delicious cakes!